Is Roswell an embarrassment to the field of UFO research? "I was a news reporter at a TV station in Champaign, Illinois at the time. I had to put together a five-part series for sweeps so I thought that UFOs would make a great subject for it. CUFOS was up in Evanston at the time, so a cinematographer and I made arrangements to spend a day at CUFOS and video the interviews. "I must have been absolutely brain-dead for not saving any of the footage. It didn't contain any shocking revelations, but it would have been an interesting indicator of where UFOlogy was in the late 70s. "One thing I do recall - neither Hynek nor Hendry ever once mentioned Roswell. Hynek did mention abductions (after I prompted him) but he wasn't sure what to make of them or whether they were part of the UFO phenomenon at all." The "Hendry" referred to is one of the investigators who worked for Hynek's Center for UFO Studies (CUFOS). I think it's pretty interesting that neither Hynek nor his investigator brought up the 1947 Roswell "UFO crash." I don't want to knock the whole Roswell thing--God knows it's given me plenty to blog about, and I am still hoping to restage "Roswell: The Musical" someday--but, besides that, isn't it a story that's run its course? "...if you were a bushman in Australia, how many parts from a Boeing 747 would you be picking up? The bushman might see an airplane fly over his territory for many years and not once be 'fortunate' enough to be witness to an air crash." Aside from his books, in the reams and reams of articles, papers and books I've combed through researching my book on Hynek, I have not come across a single mention of Roswell. Sure, Roswell is mentioned in the Project Blue Book files, but only as a part of the 1948-49 "green fireballs" mystery, and since that episode took place all over New Mexico, pretty much every town in the state was mentioned in the report, so... sorry, Roswell! 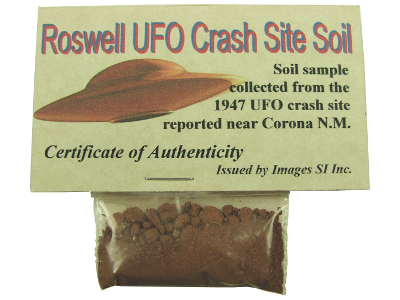 Any of you who really believes in Roswell ought to buy one of these. Otherwise, shut yer trap. I know this will hurt some peoples' feelings. One loyal reader who I know through my wife's work told me this week about a close relative who has Roswell fever, and I hate to burst her bubble, but like Dr. Hynek before me, I have to remain true to the facts. Don't get me wrong: I'd love to believe that a UFO crashed on a lonely New Mexico ranch in 1947, and that the Air Force has the wreckage of the craft and the bodies of its little green pilots on ice somewhere. But, sadly, there doesn't seem to be any proof, and there may never be. And really, when you get right down to it, even if a flying saucer had crashed in Roswell--or any of the dozens of other sites where saucers are believed to have crashed--why would the aliens allow any earth people to discover the wreckage and the corpses of their people? Roswell was a non-issue until Stanton Friedman brought it back into the publics attention in 1978. Unfortunately Friedman won't accept any theory other than UFOs are aliens from other planets/star systems. Friedman also tied his wagon to the MJ-12 papers. Many believe this topic is a red herring. Today the Roswell topic is basically a means to make money for the Roswell community and any authors that wish to dredge up that cesspool of a subject. Nothing will ever be solved at this late date and more than a few people's pocket will be lightened along the way. Part of me does want to believe the Roswell story. It certainly has persisted... What I find interesting and weird is that the people who love to talk and write about Roswell ONLY like to talk and write about Roswell, as if that's the only UFO incident that had ever mattered or will ever matter. Under the 'You Snooze You Lose' dept, UFO researcher James Fox has uncovered some handwritten letters by Dr. Hynek concerning Lonnie Zamora and the Socorro case. I wouldn't wait to long to get the book published. It looks like Fox is looking into the Hynek subject as well.